Although the chickens will soon have a nice new home, indoors is not their preferred habitat. They need a place to be outside yet remain safe from predators. This is the function of the ‘chicken run’. It seemed like it wouldn’t take too long to build, but of course it is taking longer than expected. The ground here is sooooo hard that digging is a real pain. 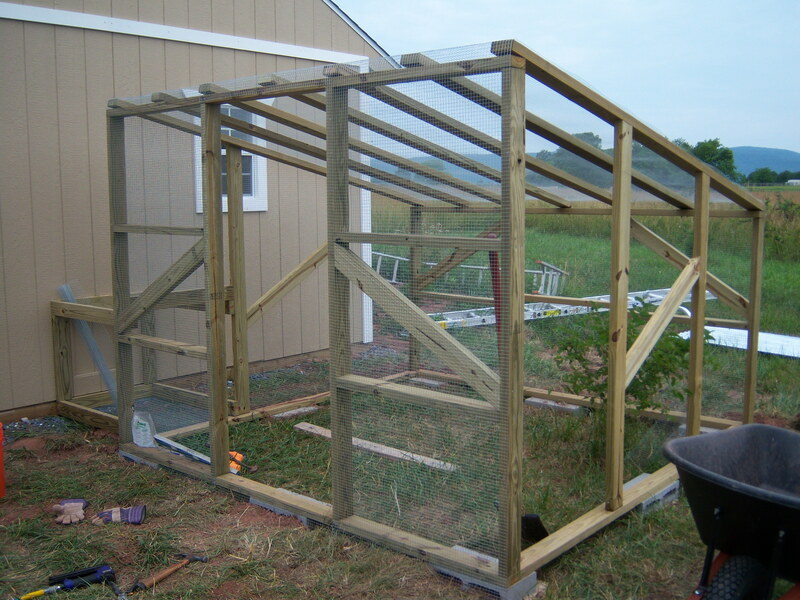 We went with corregated steel roofing, but I’ll have to climb onto the roof to install it which might be a bit tricky. There is a little ‘tunnel’ between the coop and the run. We didn’t want to screw the whole thing into the side of the brand new coop, so now it attaches by way of the tunnel. The final piece to the run will be a little access door to the yard which will only take a half hour to build – unless it actually takes an hour or three or four!